Zoisite is named for the famed collector Sigmund Zois. Discovered in Austria in 1805 in the Sau-Alp mountains, zoisite was not always considered gem material. A green specimen with hornblende inclusions and, more importantly, large opaque ruby inclusions, was discovered in 1954 making zoisite interesting for ornamental objects and some gem usage. A major variety of zoisite is tanzanite, a blue or violet colored gem, discovered in 1967. 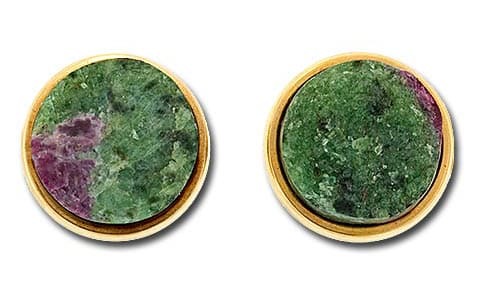 Another variety of zoisite is Thulite, an opaque red stone often confused with rhodonite. Gem Reference Guide, Los Angeles: Gemological Institute of America, 1988. Pp. 262-264. Schumann, Walter. Gemstones of the World, New York: Sterling Publishing, Co., 1977. Pp. 160.